Accessory manufacturer Hori has a new gamepad in the works that's set to bring the company's signature Fighting Commander style of fight pad to Nintendo's upcoming miniaturized Super Nintendo system. It's called, unsuprisingly, the Fighting Commander for SNES Classic Edition, and like with the other fight pads in the manufacturer's lineup, it prominently features the Super Nintendo's L and R shoulder buttons on the face of the controller in an effort to facilitate faster and more accurate combos. The controller also features rapid fire switches for each of the main face buttons, the likes of which will simulate 24 button presses per second when activated, and a slow-motion toggle option that simulates 10 presses of the start button per second. These are fairly common features for fight pads, including some of the models that were manufactured back when the Super NES was at the height of its popularity, and it's good to see them return in this latest controller. Still, some players will be left wondering what the point of the controller is, considering that North American SNES Classic systems are only set to feature one traditional fighting game: Super Street Fighter 2 Turbo. Surely it's meant for more than one game, right? In short, yes -- the Hori Fighting Commander for the SNES Classic Edition uses a wireless interface that plugs into Nintendo's Classic Controller port, the same port players have seen on the bottom of their Wiimotes. So while Hori's latest fight pad won't be able to work with original SNES hardware, the controller should be compatible with with both the Wii and the NES Classic Edition. By plugging into Wiimotes, players should also be able to use Hori's new fight pad to connect to Wii U systems, too; just don't expect them to work with the Nintendo Switch. 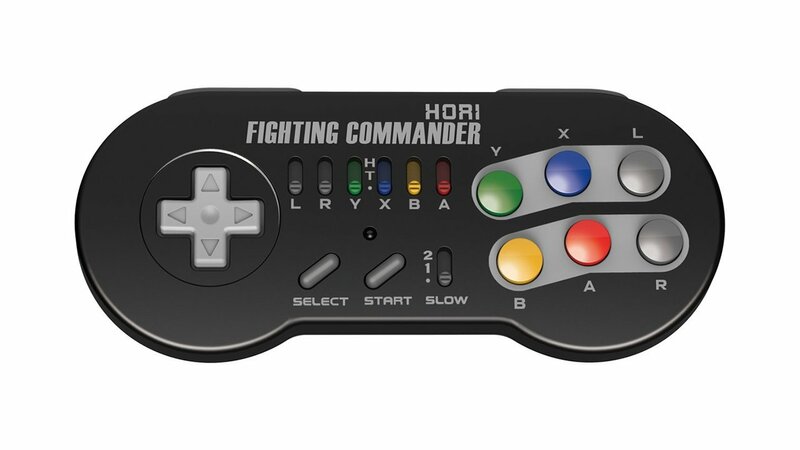 It's currently unknown whether or not Hori plans to bring their Fighting Commander controller for SNES Classic Edition systems to North America, but players can always try to scoop one up through Amazon Japan if they're so inclined. The controller is set to release on October 31, and is currently slated to cost 4,640 yen, or about 42 dollars. Nothing sets off a nice handheld console like a suitably-nice case, and we've got a selection of our favorites for Nintendo's latest hybrid console featured on our list of the Best Nintendo Switch Cases.